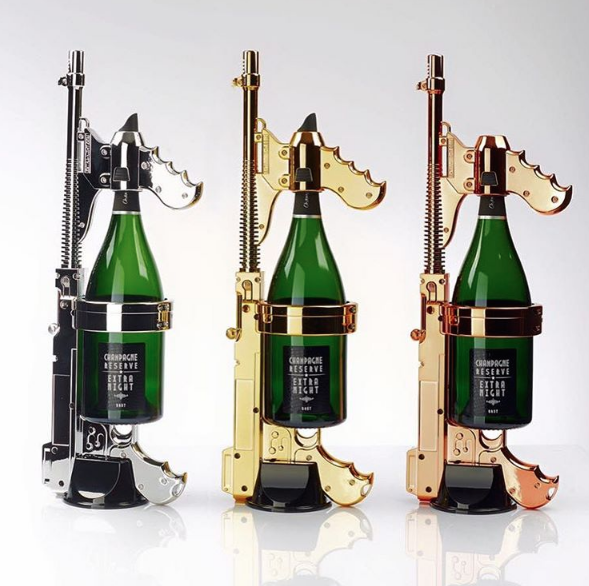 Instead of shaking a bottle and holding the top, you can now use this party weapon champagne gun which can be reloaded with any Champagne Brands Magnum Bottle and works with either a service spout or a diffuser. Now the Term "CHAMPAGNE SHOWERS" can really be taken to another level and you Bottle service and Delivery can get even more creative, it's All about the presentation! And Do it in Style!!! 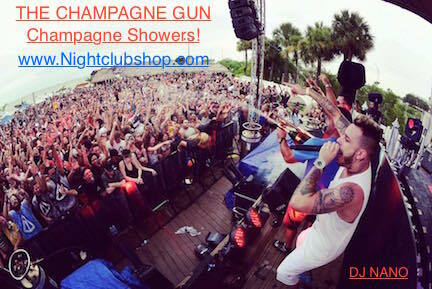 Champagne Showers: 16 to 23 feet spray for 45 seconds. Each gun come with 1 nozzle to spray, 1 nozzle to serve and 1 stand. Champagne Gun blasts 23 feet and comes in three finishes—gold, rosegold, and chrome. Works only with magnum size bottles (1.5L) - All brands except "Special Bottles"
Included : 1 service spout, 1 diffuser and 1support base.